Book Summary: A colorful train in red, orange, yellow, green, blue, and purple speeds across a simple track. Simple, block letters describe the types of car on the train through repeated sight words and short sentences. APA Reference: Crews, D. (1978). Freight train. New York, NY: Greenwillow Books. Impressions: From the first sentence on a nearly blank white page, I was captivated, “A train runs across this track.” With each page turn bold, vivid colors and text capture the eye and imagination Although very simple and two dimensional, the illustrations still manage to convey the motion and detail of the various cars. As the train begins to move, the colors blur to create a perfect spectrum of color. Simple phrases and verbs build early readers’ confidence with sight words while maintaining the action and speed of the train. Professional Review: From School Library Journal (1978) “Happily, Crews did a fine job with Freight Train’s illustrations which aptly convey the excitement of a train rushing by in a blur of color” (p. 131). DeVinney, G., & Gerhardt, L. N. (1978). 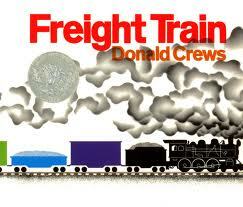 Freight train/rain (Review of the book Freight train). School Library Journal, 25(2), 131. Library Uses: This text would make an engaging story time text for early readers. Children could re-enact the story by using felt cut-outs of the train carts, tunnel, track, etc. and the teacher can help to label the motion of the train using the action verbs from the story. This entry was posted in book review, school library certification, SLIS 5420. 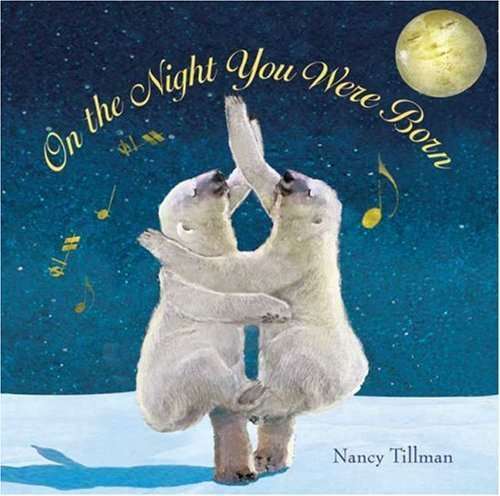 Book Summary: Tillman celebrates a newborn’s unique contributions to the world from the magical sound of a name to “wiggly, wonderful toes.” Across the earth, animals and nature join in the celebration; polar bears dance, the wind whispers, and even the moon stays up extra late. APA Reference: Tillman, N. (2005) On the night you were born. New York, NY: Feiwel and Friends. Impressions: The lilting, lyrical quality of this book recreates the comforting, rocking motion of a lullabye and leaves the adult reader with the desire to curl up in a rocking chair with an infant in his or her arms. Much like a lullaby, the images and words combine to create a peaceful sense of night with dreamlike illustrations that incorporate music notes symbolic of the night wind. The pages where text is limited to a phrase or short sentence such as, “Over the ocean….” “And through the trees…” invite very young children to explore the accompanying illustrations focusing on one idea at a time. Towards the end of the book beginning with “So whenever you doubt…” children may become restless waiting for a page turn as the text lengthens. Because of the sentimentality, abstract quality to the illustrations, and lengthy poetic pages, adults might favor this book over their young children. It will, no doubt, still help to create the bond between parent and child during a shared reading time. Janssen, C. (2007). On the night you were born (Review of the book On the night you were born). School Library Journal, 53(3), 186-187. This picture book would make an excellent mentor text for students to imitate poetry, particularly rhyming couplets. By following the basic form of the text as a poem, students could create a “On the Night I was Born” book to introduce themselves through unique facts about their own birthdays. Integrate research by having students find events that took place on the day they were born throughout history. I began my exploration as a new teacher considering technology integration with an eagerness to “get it right.” Oftentimes, I became frustrated with myself and my students when a lesson or project that centered around technology failed. My many attempts at MovieMaker, for example, left me disenchanted with the possibilities of digital storytelling. However, curiousity and perseverance prevailed as I hesitantly but patiently continued to seek and try resources and instructional technology. After several more years and a change of position, I gained back some of the confidence I’d lost. Like the pre-service teachers in Daniella Smith’s (2010) article, “Making the case for the leadership role of school librarians in technology integration” who “lacked the knowledge to link Web 2.0 technology to classroom activities” I, too, needed to find a support system that allowed me to collaborate with other teachers seeking to effectively integrate technology into the classroom. In my initial technology assessment, I commented on my strength as a professional development leader and the knowledge of specific technology tools I gained while in a coaching position. It was there that I realized how important embedded professional development is even for “digital natives [who] need instruction in how to transition to teachers who use advanced and assistive technology in the classroom” (Smith, 2010, p. 619). As a professional development team, we spent most of our time demonstrating various tools, but we failed to provide support for teachers as they sought to integrate the them, “moving them from structuralism to student-centered constructivist activities” as Smith discussed with pre-service librarians (2010, p. 620). Due to the structure of our position and limitations of our roles, little to no follow-up training was available for teachers. Now I am validated by the importance of a “supportive infrastructure that includes support for teacher initiative and involvement” (Smith, 2010, p. 620). I’m now able to reflect upon the type of campus leader I hope to become. As a “transformational leader” I will work with campus leadership “to empower school stakeholders such as teachers, community leaders, parents, and students, which serves numerous purposes [creating] long-term reform” (Smith, 2010, p. 621). To facilitate the creation of a “shared vision” I plan to initiate a library advisory committee. I see an opportunity for the committee to not only consider the new direction of the library as an information center, but also to pilot a “Bring Your Own Device” project. By allowing students to bring and use their own devices, teachers can bypass much of the headache our campuses lack of instructional technology or outdated technology often causes. My role as a leader and instructional specialist will be to support teachers as they seek to integrate various Web 2.0 tools into their instructional practices. Several products of this course including the blog and website will enable me to provide “on-demand” professional development supporting the work of this team. As I look ahead, I continue to gather the numerous tools we’ve explored in the course and utilize my new Diigo account to bookmark, organize and synthesize information I come across so that I can then share it with others. I find RSS feeds to be particularly useful and have subscribed to sites such as digitalshift.com and digitalis.nwp.org, both of which are platforms for educators to share, discuss, and collaborate on topics related to digital literacy and the integration of technology into the learning process. I’ve found and subscribed to a number of blogs, which refer me to even more blogs and sites. Most importantly, I’ve discovered a network of colleagues who are my teachers and who will continue to share their resources and experiences. Some of these colleagues are organizing into a digital committee on my campus. Other colleagues are part of national communities of learners and educators. My learning experiences in the course allowed me to move from confidence to efficacy as a teacher who integrates technology. My goal for myself was to broaden my knowledge of various tools. Like the pre-service librarians my “confidence seemed to be closely aligned with [my] knowledge of technology tools” (Smith, 2010, p. 626). I now feel that not only have I gained more knowledge than I anticipated, but I also have numerous resources to continue to explore once the course is over. I relate to the pre-service librarian who wrote, “I try new technology more readily. I am not afraid to fail if it helps me learn to succeed” (Smith, 2010, p. 624). I’ve come to understand that where technological integration is involved, learning is part of the struggle. This entry was posted in information technology, school library certification, web 2.0. In Response to "Adventures with Cell Phones"
Are student cell phones a nuisance or an asset in the classroom? School boards, administrators, and teachers have gone to great lengths to prevent student use of cell phones from interfering with learning. Sometimes, however, your greatest nemesis can become your closest ally. The war against electronic devices in schools is a futile and misguided one. We do not even hold ourselves to the expectation for students to silence, put away, and ignore their personal devices for eight hours. Faculty meetings are the best example; the greatest perpetrators of cell phone use policies are teachers themselves. As adults we have embraced and come to rely upon our personal devices to engage in the world. Are teachers using their devices during meetings to engage in the content? Usually not, although efforts could be made to incorporate their devices to raise engagement much along the same lines as students. In “Adventures with Cell Phones,” Kolb (2011) illustrates instructional practices where “a basic cell phone can be the Swiss Army knife of digital learning tools” (p. 41). Integrating personal devices into instruction 1) increases the time spent on teaching and learning that occurs inside and outside of class and 2) facilitates learning anytime, anywhere at the student’s appropriate pace. Not only is instruction more effective, but integrating students personal devices into instruction teaches them responsibility through mobile etiquette and the utilization of these skills in future professions. As new technology is developed and marketed to education, district budgets, federal grants, and state funding are decreasing. A race is on to become a “technology campus,” but campuses are ill-equipped to supply every student with an iPad. Student cell phones are free to the district. Instructional practices that utilize students’ personal devices can be integrated using a basic device that has text-messaging and camera capabilities. One practice uses Google Voice as a quizzing tool. Students call the teacher’s number, listen to a prompt, and then record their response. The messages are archived and available for MP3 file download. The teacher can then send a text message back to the student as feedback. Other practices involve taking pictures on the camera phone to Geotag and create maps. Digital storybooks can also be created using the camera on phones. Yodio (yodio.com) allows students to create collaborative storybooks. Other projects use apps such as Fickr and Photobucket to photo share. In addition to photos, students can interact with the curriculum through Classroom Response Systems at no extra charge to the school. Two sites, Polleverywhere.com, Wiffiti.com, and Textthemob.com allow students to respond to polls, questionnaires, and surveys through text and then see the results live on the screen. Before diving in and asking students to go straight to the cell phones during instruction, it is wise to provide some instruction on cell phone safety. Kolb (2011) several specials, sites, videos, and references that help students examine and understand the special issues regarding cell phone activity. When educating students on cell phone etiquette and safety, the teacher must become the mentor for appropriate use of personal devices in the school community. Libraries as well as classrooms have the potential to expand students’ academic experiences. Through the use of cell phones, students can tap into a myriad of resources and tools as readers and researchers. QR Codes or smart tags can be used to allow students immediate access to information. A QR Code could be placed on a display of summer reading titles that links students to a review of one or more titles. All the student needs to do to access the information is to scan the code using a free app such as Microsoft Tag. 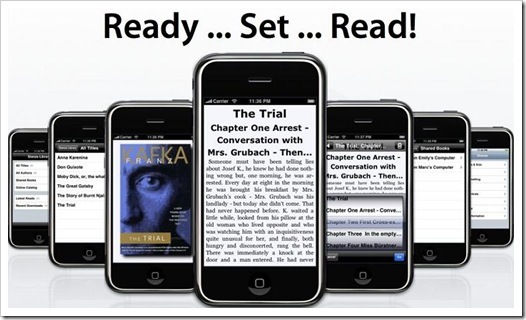 New releases can be accompanied with a tag that takes students to the book trailer or author’s website. Immediate access allows students to engage in reading as a lifelong habit. One librarian goes so far as to post codes in the bathrooms, strategically pulling students, who may not step foot into the library, into an exciting story with one quick scan. Another use of cell phones in a library includes using social media apps for readers such as Goodreads (http://goodreads.com). 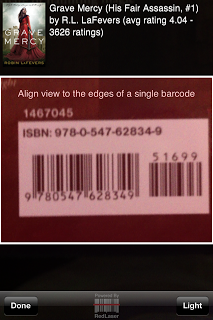 The Goodreads mobile app has a feature that allows readers to scan a book’s barcode and automatically add it to a shelf. During one ten minute trip to the library, a student could virtually stock his or her “to be read” shelf for months or add books they have read to their shelf for friends to peruse. Goodreads also provides a place to explore lists, write and read reviews, and connect with authors. Phones can also be used as personal storage devices with apps like Evernote. As students research, they can take pictures of text, write notes, and email themselves documents to be collected in a “notebook.” They can even share notebooks with collaborators. 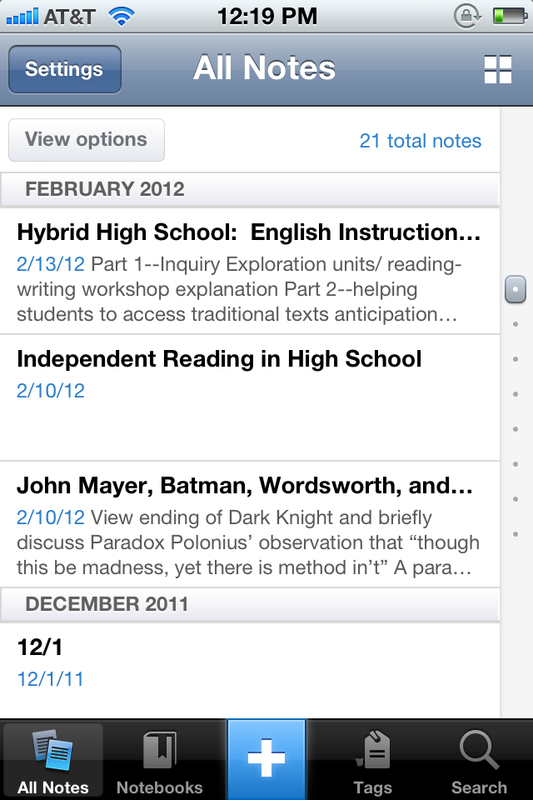 Evernote is also accessible through the website (www.evernote.com) where students can download content to evaluate, synthesize, and publish their findings. We seem to always be on the search for the next engaging tool or practice. Rather than trying to re-invent the wheel and spend an enormous amount of time engaging students in classroom instruction, let’s use what students bring to the table—their digital lives—to create a dynamic, collaborative, and creative learning environment. This entry was posted in library sciences, school library certification. In Response to "Gender, Technology, and Libraries"
As the fields continue to diversify and become more complex, it will be crucial that a balance of men and women professionals comprise the library sciences and informational technology professions. However traditional they may have been, IT and library departments will benefit greatly from an integrated workforce rather than perpetuating the gender disparity (Lamont, 2009). Lamont’s assertion that the lack of women in IT positions can be attributed to nature and perception accentuates the socio-cultural influence on women when determining a career path, often one that they place there themselves. Societal “assumptions that family and home responsibilities will cause women to be less able to contribute” may be a driving force, but women in these roles perpetuate such a perspective and their presumptiveness becomes their greatest obstacle (Lamont, 2009, p.140). Qualities of professionals in IT and library sciences may appear to be masculine and feminine: hard work, commanding, driven, and competitive vs. instinctive, intuitive, innate, and nurturing (Lamont, 2009). Perhaps these qualities can be pinpointed to specific male and female traits. What cannot be undermined is the value all of these qualities contribute to every profession. Therefore, it is a balance of personal traits, qualities, talents, and work ethic that should be considered when seeking to balance these professions, not necessarily X and Y-chromosomes. Until the culture is changed from within, traditional roles will be perpetuated. Reevaluating, redefining, and rethinking these roles as technology continues to evolve will lead to a blending of these skills. Lamont asserts (2009) “If managed properly, the best of classic library theory will combine with IT into a dynamic and diverse workforce as well as a thriving and innovative organization” (p.141). As an educator, my greatest strength has been my ability and determination to continue my own learning journey. When integrating new technology or exploring digital tools, I utilize technology as a resource to self-teach. Tools such as YouTube, Google Videos, and subscription sites such as Atmoic Learning enable me to investigate, adopt, and implement a myriad of Web 2.0 tools and hardware. I utilize colleagues and specialists in my district and networks to support my goals to integrate technology. In addition to my commitment to life-long learning, I’ve been fortunate to serve in a leadership role providing professional development to teachers, much of which was instructional technology. My background, although in depth in many areas such as Mac hardware and applications, Promethean, and a few web-based tools, is not necessarily as broad as it could be. A lack of breadth of knowledge might lead me to miss supporting teachers’ and students’ needs. In order to improve upon this weakness, I hope to gain insight into resources that will diversify my technology knowledge base in hardware, software, and web-based tools. My initiative and drive to keep learning will allow me to improve upon my weaknesses. Smart phone applications, in particular, are an area where I see tremendous potential for supporting digital students; however, I feel intimated by the sheer number that are out there let alone how best to determine their quality and usefulness. Learning to utilize personal devices and piloting initiatives such ad BYOD days (bring your own device), will support students’ information fluency. 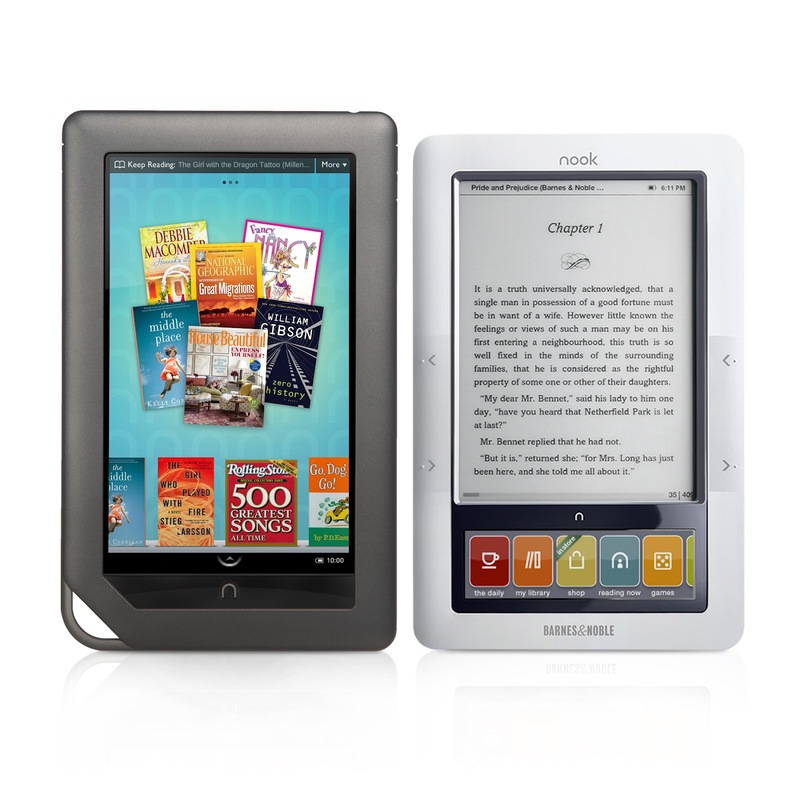 Information bombards students at astounding rates through their own personal devices they carry with them. If we can help students to harness the device as a tool rather than a perpetual information conduit and critically evaluate information, this will positively impact their problem solving and digital citizenship skills (Smaldino et al., 2012). In addition to personal devices, I hope to continue to gain experience designing and maintaining engaging, interactive sites, blogs, and spaces. I envision creating a virtual space as diverse and extensive as the physical library for students and teachers that integrates traditional learning methods with 21st century literacies and skills. In order to create such a space, I will continue to experiment with and become efficient in using platforms such as Google, Posterous, WordPress, collaboration sites, etc. A transition from the classroom or even professional development department into library and media specialist is a challenging process. Fortunately, I feel that my drive and motivation to continually learn will allow me to meet these goals as I diversify and integrate my own skill sets and qualities. Lamont, M. (2009). Gender, Technology, and Libraries. Information Technology & Libraries, 28(3), 137-142. doi: 1837038311. Smaldino, S.E., Lowther, D.L., Russell, J.D. (2012). Instructional Technology and Media for Learning. 10th ed. Boston, MA: Pearson. This entry was posted in information technology, library sciences, school library certification.